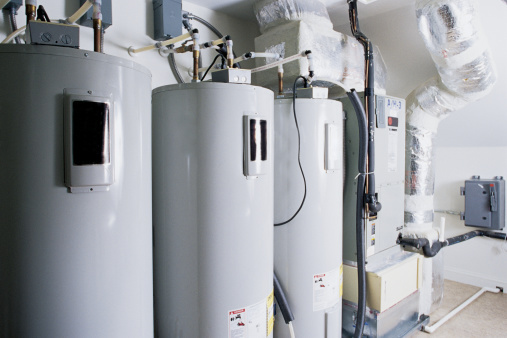 Whirlpool hot water heaters supply hot water to residential buildings. Though they don't often require maintenance, Whirlpool hot water heaters should be drained every six to eight months to remove sediment deposits in the water tank. Sediment in the hot water heater tank could damage components of the unit, which could require costly repairs. Whirlpool hot water heaters have an easy access drain valve that allows users to drain water out of the unit. Turn off the manual gas shut-off valve by twisting the valve clockwise. The gas valve is located on the left side of the hot water heater. Shut off the cold water inlet valve by turning it clockwise. The cold water inlet valve is located on the pipe that connects to the top right section of the hot water heater. Turn on all of the hot water taps in the home, including the taps in the kitchen and bathroom sinks, shower and laundry room, if applicable. This will drain a majority of the water from the hot water tank. Close all of the taps when the water stops flowing. Place a bucket under the hot water heater drain valve. The valve is located on the lower front part of the unit, to the right of the thermostats. Open the drain valve to drain the remaining water in the tank. You may have to dump the bucket a few times when draining the tank if a significant amount of water remained in the tank. Close the drain valve when the water stops draining from the hot water heater.